Super Simple bowl comes together quickly and is adaptable to tastes -- add tofu or chicken! Steamed quinoa and vegetables with either roasted tofu (for me) or stir-fried chicken (for the boys) and a Sweet & Tangy Garlic Ginger Honey Sauce. The best part is the veggies steam in a colander over the quinoa, while the tofu roasts or chicken is stir fried, so that the entire dinner comes together in 30 minutes and there is something for everyone! This was obviously is my plate: snow peas, carrots, purple cabbage, red pepper, broccoli quinoa roasted tofu and of course half an avocado. Recipe inspired by and adapted from a Tasty Buzzfeed video my son found. (It’s actually a super cute video that demonstrates how me made the recipe so take a look if you have a minute). There is so much room to adapt this bowl to taste with different veggies or even adding an egg as the original recipe did. Steamed quinoa and vegetables with either roasted tofu or stir-fried chicken and a Sweet & Tangy Garlic Ginger Honey Sauce. Veggies steam in a colander over the quinoa while you cook the tofu or chicken so the entire meal comes together quickly. Inspired by and adapted from Tasty Buzzfeed. 2-3 tablespoons Olive oil, canola oil or sesame oil. Whisk ingredients together in a liquid measuring up or small bowl until well combined. Place cubed tofu in a small bowl, add 2-3 tablespoons of dressing and toss to coat. Let sit 10 minutes. (or less if you're short on time, will still taste great). Place tofu with marinade in single layer on prepared baking sheet. Place chicken in a small bowl and toss with 3-4 tablespoons of marinade, and let sit for 10 minutes or so. Heat oil in a large saucepan over medium heat. Add chicken along with its marinade and saute for about 10 minutes, flipping once so that chicken cooked through. Add the quinoa and water (or broth) to a medium pot and bring to a boil over high heat. Once boiling, reduce heat to low and place a strainer over the simmering quinoa. Add carrots, snap peas, purple cabbage, bell pepper, and broccoli to the strainer. Cover the strainer and pot, and cook for 20 minutes. Remove strainer from top of pot and set aside. 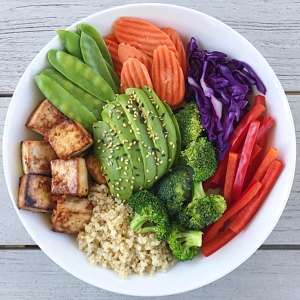 To each bowl, add quinoa, steamed veggies, roasted tofu or stir fried chicken and ½ an avocado. Pour additional dressing over the bowl to taste. Garish with scallions or sesame seeds.